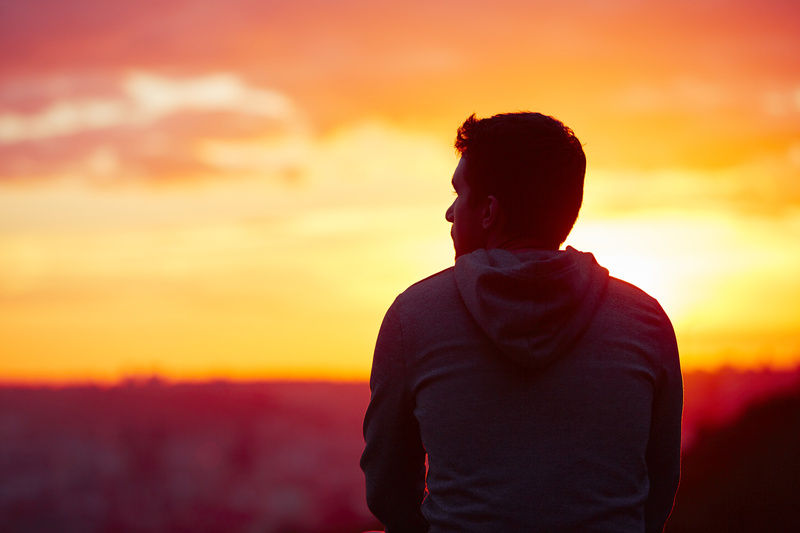 What does it mean to live as a single man in today’s world? Some men are single at 20, others at 60. Some are single by choice, others by undesired circumstance. Some have always been single, others become so again following divorce or the death of a spouse. How does God’s Word give us a vision for living single for his glory? “God created man in his own image” (Gen. 1:27). The most fundamental thing Scripture says about a man’s singleness is that it isn’t what’s most fundamental about him. Every man, single or married, is made in God’s image. Therefore, dignity is not conditioned on singleness or marriage. Our worth is rooted not in our marital status, but in our creational status. This is nowhere more clearly confirmed than in Jesus Christ, who shows us what it means to be truly human. He lived a perfect life as God’s image (Col. 1:15)—and he did so unmarried. The life of singleness, therefore, is not in itself inferior to the life of marriage. Jesus honored marriage and upheld a high standard for marital faithfulness (Matt. 19:3–9). Yet he also taught that marriage is not a requirement; some may remain single by necessity or choice (Matt. 19:11–12). The apostle Paul conducted his ministry as an unmarried man (1 Cor. 7:8; 9:5), and he taught that singleness is a gift (1 Cor. 7:7). Whether single or married, we can receive our life situation as a good and wise gift from God. Singleness also has unique benefits. One advantage is the absence of the challenges of marriage. Paul notes that the unmarried will be spared the “worldly troubles” and “anxieties” of marriage (1 Cor. 7:28, 32–33). Instead, the unmarried person is “anxious about the things of the Lord, how to please the Lord” (v. 32). He’s able to pursue “undivided devotion to the Lord” (v. 35). Jesus similarly noted the legitimate choice of some to remain single for the sake of his kingdom (Matt. 19:12). The greatest benefit for the single man is the potential for single-minded devotion to Christ and his mission. This positive vision of singleness in the New Testament is explained by its place in the storyline of the Bible. In the Old Testament, marriage is the norm and singleness is rare. In the New Testament, though, marriage remains the norm but singleness is elevated as uniquely beneficial. Following the trajectory into the new creation, earthly marriages will be swallowed up in that supreme love to which human marriage points (Mark 12:25; Luke 20:34–36). Earthly marriage exists to point forward to the ultimate union of Christ and his church (Rev. 19:7–9). Since the new creation has broken into the present through Christ, we now live with a forward tilt toward the age to come. Added to the original commission to multiply persons (Gen. 1:28) is the commission to multiply disciples (Matt. 28:18–20). Marriage is required for the first, but not the second. Indeed, single men may now live with strategic, single-minded devotion to this mission. The single life is not without its challenges. The first problem Scripture addresses is Adam’s aloneness: “It is not good that the man should be alone” (Gen. 2:18). Adam’s need was immediately met by a wife. Most single men have a good but unfulfilled desire for this. Others will perhaps need to take steps to cultivate this desire. Marriage should be esteemed, and most men should intentionally pursue it (Heb. 13:4). Further, “because of the temptation to sexual immorality, each man should have his own wife and each woman her own husband” (1 Cor. 7:2). Marriage is a normal, necessary, and good gift for most men to pursue (Prov. 18:22). Single men will also need to wisely navigate challenges in relation to their sexuality. We will need to consider appropriate and God-honoring ways to relate to the women in our lives. Paul advises Timothy, for example, to treat “younger women as sisters, in all purity” (1 Tim 5:2). Sexual activity is reserved exclusively for the context of marriage, and God’s will is clear: abstain from sexual immorality (Gal. 5:19; Eph. 5:5; Col. 3:5; 1 Thess. 4:3). This is especially difficult in light of our hypersexualized culture. We need Spirit-given wisdom and discipline in order to please the Lord and honor women with our thoughts, eyes, words, and bodies. Loneliness is another unique challenge of singleness. While marriage was the immediate answer for Adam’s solitude, the story of Scripture shows friendship and the family of God are also his provision. Not everyone needs marriage, but everyone needs friendship. The single man is not to be a lonely man. Friendship is an often underappreciated necessity of life. Returning to the examples of Jesus and Paul, both modeled a commitment to friendship. Jesus stayed close with 12 friends, three of whom were closest (Peter, James, and John) and one closer still (John). In his most lonely moment before the cross—in the garden of Gethsemane—Jesus wanted his three closest friends near (Matt. 26:38–39). Likewise for Paul: in the book of Acts he rarely traveled without friends, and at the end of his life he asked Timothy, one of his closest friends, to be with him (2 Tim. 4:9). What does it look like to pursue this kind of friendship? Proverbs gives four marks of friendship. First, friendship is marked by closeness. As Proverbs 18:24 says, “A man of many companions may come to ruin, but there is a friend who sticks closer than a brother.” What passes today for friendship is often little more than acquaintanceship. Men need a friend who will be closer than a brother, a “friend who is as your own soul” (Deut. 13:6; cf. 1 Sam 18:1, 3). The second mark of friendship is constancy. “Many a man proclaims his own steadfast love,” Proverbs 20:6 says, “but a faithful man who can find?” Indeed, a friend “loves at all times” (17:17). An acquaintance affirms his love, but a true friend demonstrates it through thick and thin. He doesn’t become detached when you’re suffering; he joins you in the trial. A fair-weather friend is there when we’re useful, but a faithful friend is there even when we have nothing to give (19:4, 6). Third, friendship is marked by transparency. A faithful friend is open and honest, for friendship includes giving and receiving wise counsel. Yet we also need the friend who will speak hard but necessary words. He knows the real you, behind the mask; and, knowing you, he speaks with candor and forthrightness. As Proverbs 27:6 observes, “Faithful are the wounds of a friend; profuse are the kisses of an enemy.” Many may shower you with “verbal kisses,” but a true friend will speak the truth in love. Finally, the foundation of friendship is trust. Distrust cracks the foundation; trust strengthens it. This is why Proverbs says the two kinds of people who separate close friends are “a whisperer” (16:28) and “he who repeats a matter” (17:9). These are “friends” who pass along what’s shared confidentially and who bring up thing that should be long forgotten. They are not safe—and, without safety, friendship can neither deepen nor endure. Single or married, we all look ahead to the new creation when Christ will be our Faithful Husband and Great Friend and we will enjoy him as a community of friends. We don’t have to wait. He has given his life for us as his bride (Eph. 5:22–33) and he has made us his friends (John 15:13–15). Through faith in him, we already experience this eternal marriage and friendship. Receiving this, singleness need not be a life of solitude but can be rich with friendship. Nor should it be aimless, for it is a privileged opportunity to pursue a life of pleasing Christ and making disciples. Even if marriage is on the horizon, as long as a man is single, his life need not be defined by waiting. Rather, he can be diligent with Christ’s mission in ways unique to the opportunities of singleness. Editors’ note: This excerpt is adapted from the ESV Men’s Devotional Bible (Crossway, 2015). Drew Hunter is the teaching pastor at Zionsville Fellowship in Zionsville, Indiana, where he lives with his wife and three young boys. Drew blogs at Gospel Refresh. You can follow him on Twitter.